Port Jefferson Station, NY - By Lon Cohen - portjefferson.com - Semiral “Sam” Catalbas says it’s easy to guess why she’s opening Chit Chat Café, a Turkish-American café and grocery store on Route 112 in Port Jefferson Station. “Because I’m Turkish,” she says with a smile, her accent clearly coming through her words. The Port Jefferson Station resident, who said that her husband owns a gas station, is originally from the cosmopolitan city of Istanbul in Turkey but has lived in the United States for the past 10 years. Catalbas partnered with her cousin, Gilly Akcay, who is also the landlord, to open the new café. “He knows good Turkish food,” she said. Catalbas says that Chit Chat Café will be the type of place where people can go to find Turkish and American food over the counter or in the small grocery area at good prices. She plans to serve Turkish Tea, Baklava, Kumpir (a type of baked potato) and Turkish style coffee among other items. It's taken them over a year to renovate the space. The interior is just about finished and according to Catalbas they have a grand opening in a couple of weeks, right after they get their final permits and the last inspection is completed. Turkish style food isn’t nearly as popular as the Chinese or Italian restaurants that dot the suburban landscape on Long Island. As a matter of fact, the food guide Zagats only lists 18 Turkish restaurants on all of Long Island. It’s a niche item to be sure. Konak in Farmingville is the closest Turkish market you can find. The nearest Turkish restaurants are in East Setauket and Patchogue. Joff Sahin happens to own both of them. As owner and chef at Medford Pita House in Patchogue, Sahin says that he was one of the first to bring Turkish food to Long Island, almost 20 years ago. With his other location in East Setauket, he knows that the restaurant business–especially for a niche food–is hard work. In 1993, when Sahin opened Medford Pita House, there weren’t any others like his. Sahin says the restaurant business is tough enough but Turkish food is especially hard because everything has to be prepared fresh. There’s no mass-produced Turkish food available here. “You really have to know what you’re doing to run a truly nice restaurant,” he said. Fresh food spoils in a few days if it’s not sold and the margins are thinner than a slice of lamb. As a matter of fact, he doesn’t make much money at all on lamb, a staple item on the Turkish plate. According to Sahin, a leg of lamb that costs him $60 will lose him money after he cuts it up for kabobs, gyros, and a shank. When he factors in the price for serving soup and salad with a meal along with salaries for the waitresses and chef, he’s left with barely anything. The dream of opening your own restaurant “is getting harder and harder,” said Sahin. Still, Chit Chat Café owners Catalbas and Akcay aren’t betting it all on restaurant food. Their business idea is akin to a Turkish coffeehouse. 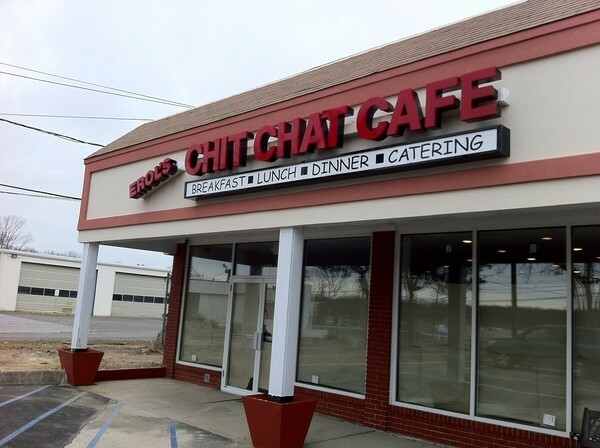 The reason they named it the Chit Chat Café is because they want it to be a place where people can sit and talk over tea or coffee. In addition to espresso, hot chocolate, American and Turkish coffees they also want to offer dessert coffees and liquors. They will even have games like Tavla, a Turkish style of backgammon, on the tables for people to play.